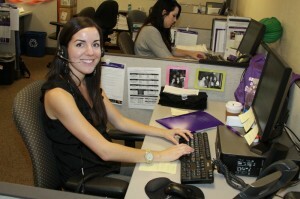 Plans are in the works for an online job board that will allow employers to seek GCU students for hire. Until then, Smith urges students to visit Career Services in the Student Union, or even to visit Facebook.com/GCUCareerServices to view available positions on campus. Even if there is not an opening in a specific field or major, any work experience is a benefit. From meeting employer expectations and dressing properly to learning about good work habits, GCU job opportunities will help establish recent graduates as qualified and quality employees. “Grand Canyon University is a growing company and there is great potential here,” says Jeff Ogne, a recent graduate and now full-time admissions counselor. Benefits include the ability to earn a master’s degree under the employee tuition benefit program and generous provisions for paid time off. Even hanging out with college friends during his lunch break has made the transition from school to career an easy one for Ogne. It is not as if you are stuck as a “lifer,” as Ogne and Smith point out. “Many employees will get their master’s and move on to other positions outside of Grand Canyon University where they can make our school proud,” Ogne says. Derek Garth graduated last year with a bachelor’s in history and a business minor, and he now works as an events coordinator in the Athletic Department. He is now able to afford working toward a double master’s in business administration and leadership.